Taking the stage with a grin so ebullient it managed to infect the room with its cheer and enthusiasm, bandleader/ mandolin phenom Chris Thile announced “I have been waiting SO long to do this!” It was certainly a long time coming, but Friday night, the Punch Brothers finally, FINALLY, delivered a headlining performance proper in the nations Capital. Since forming in 2006, the group has skated along the outskirts of what most would consider mainstream music, and thus mainstream venues. They’ve built their following slowly, playing to the more traditional bluegrass crowds and festivals along the way, yet they’ve never compromised the underlying evil genius mastery of their instruments that provides the bedrock of their music. Who's feeling young NOW - Punch Brothers tearing it up at the 9:30 ClubWith a sound that has often been described as “prog-grass”, listening to a Punch Brothers record can be a cognitive workout that simultaneously leaves the listener both satisfied and exhausted – and that’s sort of the point. This is a band that’s all about balancing acts, and this years Who’s Feeling Young Now was a delirious example of the bands willingness to balance the intellectual with the populist, and in the process subvert the listener’s expectation of what a “pop” song can, and should, be. That delicate balance was on full display Friday night at the 9:30 Club as the band delivered a set that touched on just about every point of the bands career as well as a few other bands careers just to show that they could. From the opening notes “Movement And Location” the band proceeded to tear through a two hour set that worked as much to support their latest album as it did to service some of their older “hits” with some choice covers and even a couple of moving tributes to some recently deceased musicians thrown in for good measure. 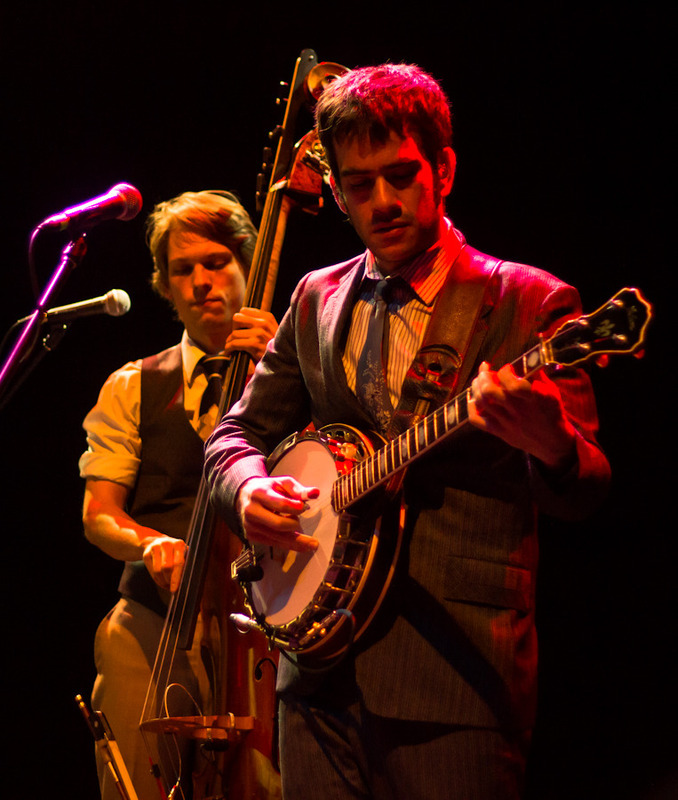 While Punch Brothers certainly have a catalog deep enough at this point to solely focus on their own music, it didn’t stop the band from launching into a mid set cover of Becks “Sexx Laws” that sounded as out there as it did simply the right thing to do thanks to the talents of banjo player Noam Pikelny. Also of note was fiddle player Gabe Witcher’s delivery of the Josh Ritter penned “Hundred Dollars” (Thile isn’t the only singer in the band) which morphed from the gritty bit of noir-ish songwriting as presented on Who’s Feeling Young Now, to an R&B infused, bump and grind showdown between the Punch Brothers and the members of the audience. And then there was that cover of Radiohead’s “Kid A”. Punch Brothers Noam Pikelny and Paul KowertWe’ve talked about the song both in my review and on the podcast pretty extensively so there’s really not anything more to add except to say take how great it is on record and double that…by a million. As a standalone track it works just fine, but live, sandwiched between two more traditionally “bluegrass” songs it gives the band yet another opportunity to show of their chops. In tackling this particular piece of rock/pop history, the band shows just how well they can execute outside the supposed boundaries of the genre that they are operating in. It’s a cover that handles its source with a sincere reverence, yet feels nothing like the material from whence it sprang. The contrast between “Kid A” and tracks like “Don’t Get Married Without Me”, “Alex” and “Patchwork Girlfriend” couldn’t be more startling, yet somehow they not only make it all make sense, but they manage to entertain completely at the same time as they are blowing your mind. Closing out the night with a played straight tributes to the late Earl Scruggs followed by a huge semi conducted sing-a-long of The Bands “The Weight” to honor last weeks loss of drummer Levon Helm, the Punch Brothers closed out their triumphant debut at the 9:30 Club by simply celebrating great music in just about every way that the band knows how. In a set full of subtle fugues, instrumental heroics that ran the gamut from Davis (Miles that is), to Hendrix, to the aforementioned Scruggs and back again, and even a killer cover of The Cars “Just What I Needed”, the Punch Brothers proved with relative ease they are truly the greatest American band playing today. Those may sound like strong words until you consider that no other band since, well, The Band, has been able to mix so many different types of music so effectively, and with such a sense of joy as to make you feel like you’re not just seeing a great performance from a band, you’re seeing a legend in the making. The Punch Brothers are that band and if anyone didn’t know it walking in to the show Friday night, they most certainly know it now. Check out the rest of our shots from the show by clicking the image below! Tagged: 9:30 Club, Chris Thile, Punch Brothers, Who's Feeling Young Now? Older Post6 Reasons Why The Sweetlife Festival Is Your DESITNY Tomorrow!!! Copyright © 2011-2018, ChunkyGlasses.com. All rights reserved.